As a small business accountant, your clients often judge you not only by the accuracy of your documents, but on how they look. When you present quarterly financial statements, annual reports or audits, or proposals for future work, a professional-looking document can increase client confidence and make them glad that they went with a smaller firm rather than one of the Big Four. Since most of the materials you give to them are documents they will handle often, dog-ear, and make notes on, you want them to be durable as well as good-looking. Spiral or coil binding is the ideal solution, and new equipment allows accountants to create spiral bound documents in-house. Saddle stitching, which resembles stapling, is the least expensive, no-frills process of punching wire through the outside spine of the document and then bending the wire flat on the inside center to make it lie flat. You can use this for documents up to 40 pages, but the net result is that the document does not lie completely flat. Over time, the pages can break away from the staple. Plastic comb binding, which you can accomplish if you have a small desktop machine, can also be done at a print shop. The result looks fine, but pages can break away at the comb or slip out if the owner handles the document frequently or tries to fold the pages back upon themselves. Coil or spiral binding, which uses a plastic or metal coil that is spun through holes is a more durable way of binding than comb methods for documents that are likely to be folded back upon themselves, studied, and annotated. Removing the pages requires forcefully ripping them out, an indication of the sturdiness of this method. Many companies with good quality in-house copy machines often weigh the cost of taking jobs to outside vendors. Digital monochromatic copies run about .04 cents a page and color copies under $.20 page, as compared to big box office supply store or local printer prices of $.11 a page for black and white copy, or at least $.59 for color. Binding at a print center might average $2.71 for saddle stitching, $2.98 for comb binding or $3.58 for coil binding. However, for companies who have the need to occasionally bind documents, the process is now more convenient and cost-effective than ever. Rhin-O-Tuff, a manufacturer of commercial binding equipment, has just introduced the Coil Binding 3000, a desktop size unit that is economical for even small companies to buy. 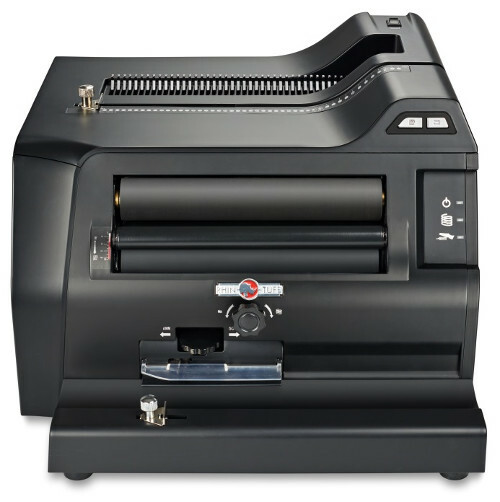 This new machine enables you to take materials you have copied in-house, drill holes in the stack of papers, insert a coil or spiral into the holes, and crimp the ends of the coil to create a document of any size. The cost on the coils varies, but on average you can bind a one-inch thick document for just $.50 or less. Its small footprint takes up about the same amount of space as a desktop printer, and because it is so fast and easy to use, you will be producing great-looking professional documents in no time. For information about the new Coil Binding 3000, contact Rhin-O-Tuff today at 800-390-5782 or 208-384-8551.